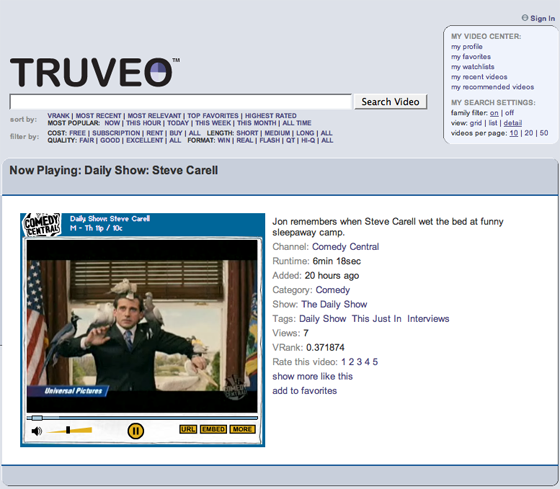 Truveo, which was acquired by AOL in early 2006, is considered to be one of the best video search engines on the Internet. It looks beyond metadata attached to the video file itself and explores the content on the website around the video – resulting in more data to index and better search results. The traffic figures support this. Comscore reports that the site has 40 million monthly unique visitors and is growing at about a 50%/month rate. Truveo says this is a combination of their approach to search as well as the fact that copyright holders are becoming more diligent about pulling down unauthorized uploads on YouTube and other sites. The result is that YouTube is no longer the single place to find good video clips. People are turning to search to find Daily Show clips on the Comedy Central website, for example, instead of just looking for them on Youtube. The company is also partnering outside of AOL to get broader distribution for the engine. Brightcove, Clevver, CSTV, Flock, Pageflakes, PureVideo, Qwest, Search.com, Sportingo, Netvibes, Widgetbox and YourMinis all now use Truveo for video search, joining existing partners AOL Video, AOL Search, Excite, Infospace. There’s a new kid on the block, though, called CastTV, which recently announced a $3.1 million Series A round of financing from Draper Fisher Jurvetson. They haven’t launched yet, but the results from demos show it to be as good or better than Truveo. Given that AOL already owns Truveo, look for a quick acquisition of CastTV, probably by Google, if the technology is as good as the demos suggest.